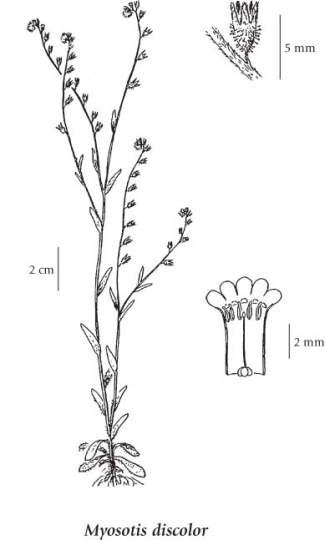 Annual herb from fibrous roots; stems simple or branched, erect, slender, with spreading hairs below and appressed hairs above, 8-50 cm tall. Lowermost leaves oblanceolate, somewhat stalked, 1-4 cm long and 2-8 mm wide; middle and upper leaves oblong to narrowly elliptic or linear, more or less unstalked; straight-hairy on both surfaces, entire, alternate. Several to many in lax, coiled, elongating, terminal clusters, the bracts 0 or 1-2 near the base; inflorescence not much longer than leafy part of stem; fruiting stalks ascending or spreading, 1-3 mm long, shorter than calyces; corollas at first yellow or white, becoming blue; petals fused at base into a tube that flares (1-2 mm wide) at top to 5 small lobes, the throat with 5 bulges; fruiting calyces 3-5 mm long, sepal-tube covered with short, spreading, hooked hairs, the lobes short appressed-hairy. Nutlets 4, clustered together, egg-shaped, dark brown to black, smooth, shining. Moist to mesic roadsides, ditches and disturbed areas in the lowland and lower montane zones; frequent on S Vancouver Island, the Gulf Islands and adjacent coast, rare E of the Coast-Cascade Mountains; introduced from Europe.